Insoluble nanoparticles in cosmetic products are essentially used as UV-filters or preservatives.Nanoparticles alter properties of cosmetic products including color, transparency, solubility and chemical reactivity. It is unclear to what extent insoluble nanoparticles are used in cosmetic products. FOUND IN: deodorants, toothpastes, shampoos, lotions, foundation, anti-aging creams, and nail polish. WHAT TO LOOK FOR ON THE LABEL: Fullerenes, micronized zinc oxide, nano zinc oxide, micronized titanium dioxide, micronized quartz silica. Nano-sized particles exist in nature and can be created from a variety of elements and compounds, such as carbon or silver. Most nanoscale materials are too small to be seen with the naked eye or conventional lab microscopes. Some nanomaterials are referred to as engineered nanomaterials (ENMs) which are used to design pharmaceuticals, electronics, and can be added to cloth or other materials to make them stronger yet lighter. HEALTH CONCERNS: Studies have indicated that low solubility nanoparticles tend to be more toxic than larger particles of the same material. However, we know very little about the potential effects on human health and the environment due to research gaps related to nanoscale materials. Inhalation of nanomaterials may lead to inflammation and oxidative stress.,, The molecular charge of nanoparticles may play a role in body’s response to inhalation exposure. Some minerals become invisible but still absorb UV radiation at the nanoscale. These UV-filtering substances are increasingly used for broad-band sun protection including UVA radiation. 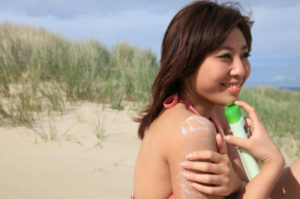 Titanium Dioxide (TiO2): TiO2 nanoparticles may be more toxic than larger particles of TiO2, which pose few health hazards., Many studies have found that non-nanoized TiO2 used as a mineral UV-filter in sunscreen cosmetic products does not penetrate healthy skin and poses no human health risks from skin exposure.,,, However, rats and mice exposed to nanoized TiO2 (normally <100 nm) experience significant lung inflammation,, and DNA damage. This raises concerns that human inhalation of TiO2 could also lead to adverse health effects. Zinc Oxide (ZnO): Studies have found that even low concentrations of ZnO may lead to damage in human epidermal cells. Yet, a review of the risks of nano-structured TiO2 and ZnO found nanoized TiO2 and ZnO are not likely to penetrate the skin due to how they are bound. The researchers concluded both materials are safe to use as UV filters. Silver: Nanoized silver may lead to oxidative stress and resulting cell damage. Silver nanoparticles have shown toxic effects on the male reproductive system. Research suggests that nanoparticles cross the blood-testes barrier where they can be deposited into the testes with the potential for adverse effects on sperm cells. Studies have shown silver nanoparticles can bind to different tissues and can cause a number of toxic effects that gradually lead to cell death. Silica: Nanoized silica may lead to pregnancy complications when injected intravenously into pregnant mice. It also appears nanoized silica can cross the placenta, leading to deposits in the fetal liver and fetal brain. Ultrafine crystalline silica (SiO2) nanoparticles induce cell damage leading cell mutations and cancer cells with two nuclei in human in vitro cells. Carbon Black: Ultrafine carbon black particles may alter genes in lung cells, lead to inflammation and inhibit the growth of cells that line the circulatory system. , Research suggests nanosized carbon black may lead to mutations in the lung cell of rats exposed 15 months earlier. REGULATIONS: FDA monitors the use of nanotechnology and the use of nanoscale materials in cosmetics, but does not ban nanomaterials. The European Commission prohibits the use of zinc oxide as a UV filter. HOW TO AVOID: Research has shown nanoized particles can be potentially harmful when inhaled. Avoid loose cosmetic powders and aerosol sunscreen products that contain nanoized TiO2 or ZnO. Don’t forget to check the ingredient labels of your personal care products. FDA: U.S. Food and Drug Administration. Nanotechnology. 2016. Available online: http://www.fda.gov/Cosmetics/ScienceResearch/Nanotech/default.htm (accessed October, 2016). CDC: Centers for Disease Control. Nanotechnology. 2016. Available online: http://www.cdc.gov/niosh/topics/nanotech/default.html (accessed October, 2016). Friends of the Earth Report – Nanomaterials, Sunscreens and Cosmetics: Small Ingredients Big Risks. Available from: http://www.nano.foe.org.au, http://www.foe.org [Last accessed on 2006]. Ryman-Rasmussen JP, Riviere JE, Monteiro-Riviere NA. Penetration of intact skin by quantum dots with diverse physicochemical properties. Toxicological Sciences. 2006 May 1;91(1):159-65. Semmler M, Seitz J, Erbe F, Mayer P, Heyder J, Oberdorster G, et al. Long-term clearance kinetics of inhaled ultrafine insoluble iridium particles from the rat lung, including transient translocation into secondary organs.Inhal Toxicol 2004: 16(6-7):453-9. Semmler-Behnke M, Takenaka S, Fertsch S, Wenk A, Seitz J, Mayer P, et al. Efficient elimination of inhaled nanoparticles from the alveolar region: evidence for interstitial uptake and subsequent reentrainment onto airways epithelium. Environ Health Perspect. 2007 May; 115(5):728-33. Oberdörster G, Sharp Z, Atudorei V, Elder A, Gelein R, Kreyling W, et al. Translocation of inhaled ultrafine particles to the brain. Inhal Toxicol 2004; 16:437-445. Elder A, Gelein R, Silva V, Feikert T, Opanashuk L, Carter J et al. Translocation of inhaled ultrafine manganese oxide particles to the central nervous system. Environ Health Perspect 2006; 114(8):1172-1178. Kreyling WG, Semmler-Behnke M, Möller W. Health implications of nanoparticles. J Nanopart Res 2006a;8:543-562. Nemmar A, Hoet PH, Vanquickenborne B, Dinsdale D, Thomeer M, Hoylaerts MF, et al. Passage of inhaled particles into the blood circulation in humans. Circulation 2002a; 105(4):411-414. Nemmar A, Hoylaerts MF, Hoet PH, Dinsdale D, Smith T, Xu H, et al. Ultrafine particles affect experimental thrombosis in an in vivo hamster model. Am J Respir Crit Care Med 2002b; 166(7):998-1004. Oberdörster G, Sharp Z, Atudorei V, Elder A, Gelein R, Lunts A, et al. Extrapulmonary translocation of ultrafine carbon particle following whole-body inhalation exposure of rats. J Toxicol Environ Health 2002; 65(20):1531-1543. Kreyling W, Semmler M, Erbe F, Mayer P, Schulz H, Oberdorster G, et al. Translocation of ultrafine insoluble iridium particles from lung epithelium to extrapulmonary organs is size dependent but very low. J Toxicol Environ Health 2002; 65(20):1513-1530. Khandoga A, Stampfl A, Takenaka S, Schulz H, Radykewicz R, Kreyling W, Krombach F. Ultrafine particles exert prothrombotic but not inflammatory effects on the hepatic microcirculation in healthy mice in vivo. Circulation 2004; 109(10):1320-1325. Nemmar A, Hoylaerts MF, Nemery B. Effects of particulate air pollution on hemostasis.Clin Occup Environ Med. 2006;5(4):865-81. Bai N, Khazaei M, van Eeden SF, Laher I. The pharmacology of particulate matter air pollution-induced cardiovascular dysfunction. Pharmacol Ther 2007;113(1):16-29. Xia T, Kovochich M, Brant J, Hotze M, Sempf J, Oberley T, et al. Comparison of the abilities of ambient and manufactured nanoparticles to induce cellular toxicity according to an oxidative stress paradigm. Nano Lett 2006; 6(8):1794-1807. Oberdörster G. Pulmonary effects of inhaled ultrafine particles. Int Arch Occup Environ Health 2001; 74(1):1-8. Sager TM, Kommineni C, Castranova V. Pulmonary response to intratracheal instillation of ultrafine versus fine titanium dioxide: role of particle surface area. Part Fibre Toxicol 2008; 5: 17. Gamer AO, Leibold E, van Ravenzwaay B. The in vitro absorption of microfine zinc oxide and titanium dioxide through porcine skin. Toxicol In Vitro. 2006;20(3):301-7. Lademann J, Weigmann H, Rickmeyer C, Barthelmes H, Schaefer H, Mueller G, et al. Penetration of titanium dioxide microparticles in a sunscreen formulation into the horny layer and the follicular orifice. Skin Pharmacol Appl Skin Physiol 1999;12(5):247-56. Grassian VH, O’Shaughnessy PT, Adamcakova-Dodd A, Pettibone JM, Thorne PS. Inhalation exposure study of titanium dioxide nanoparticles with a primary particle size of 2 to 5 nm. Environmental health perspectives. 2007 Mar 1:397-402. Gurr JR, Wang AS, Chen CH, Jan KY. Ultrafine titanium dioxide particles in the absence of photoactivation can induce oxidative damage to human bronchial epithelial cells. Toxicology. 2005 Sep 15;213(1):66-73. Trouiller B, Reliene R, Westbrook A, Solaimani P, Schiestl RH. Titanium dioxide nanoparticles induce DNA damage and genetic instability in vivo in mice. Cancer research. 2009 Nov 15;69(22):8784-9. Schilling K, Bradford B, Castelli D, Dufour E, Nash JF, Pape W, Schulte S, Tooley I, van den Bosch J, Schellauf F. Human safety review of “nano” titanium dioxide and zinc oxide. Photochemical & Photobiological Sciences. 2010;9(4):495-509. Hussain SM, Hess KL, Gearhart JM, Geiss KT, Schlager JJ. In vitro toxicity of nanoparticles in BRL3A rat liver cells. Toxicol In Vitro 2005; 19(7): 975-983. McAuliffe ME, Perry MJ: Are nanoparticles potential male reproductive toxicants? A literature review. Nanotechnology 1:204-210, 2007. Xia T, Kovochich M, Brant J, Hotze M, Sempf J, Oberley T, Sioutas C, Yeh JI, Wiesner MF, Nel AE: Comparision of the abilities of ambient and manufactured nanoparticles to induce cellular toxicity according to an oxidative stress paradigm. Nano Lett. 8:1794-1807, 2006. Rouse JG, Yang J, Ryman-Rasmussen JP, Barron AR, Monteiro-Riviere NA. Effects of mechanical flexion on the penetration of fullerene amino acid-derivatized peptide nanoparticles through skin. Nano Lett 2007; 7(1):155-60. Miyata N, Yamakoshi Y, Nakanishi I. Reactive species responsible for biological actions of photoexited fullerenes. Yagaku Zasshi 2000;120: 1007-1016. Yamakoshi Y, Umezawa N, Ryu A, Arakane K, Miyata N, Goda Y, et al. Active oxygen species generated from photoexcited fullerene (C60) as potential medicines: O2-* versus 1O2. J Am Chem Soc 2003;125:12803-12809. Yamashita K, Yoshioka Y, Higashisaka K, Mimura K, Morishita Y, Nozaki M, Yoshida T, Ogura T, Nabeshi H, Nagano K, Abe Y. Silica and titanium dioxide nanoparticles cause pregnancy complications in mice. Nature nanotechnology. 2011 May 1;6(5):321-8. Wang JJ, Sanderson BJS, Wang H. Cyto- and genotoxicity of ultrafine TiO2 particles in cultured human lymphoblastoid cells. Mutat Res 2007; 628: 99-106. Shukla A, Timblin C, BeruBe K, Gordon T, McKinney W, Driscoll K, et al.Inhaled particulate matter causes expression of nuclear factor (NF)-kappaB-related genes and oxidantdependent NF-kappaB activation in vitro. Am J Respir Cell Mol Biol 2000; 23: 182-187. Yamawaki H, Iwai N. Cytotoxicity of water-soluble fullerene in vascular endothelial cells. Am J Physiol Cell Physiol 2006; 290: C1495-C1502. Driscoll E, Deyo LC, Carter JM, Howard BW, Hassenbein G, Bertram TA. Effect of particle exposure and particle-elicited inflammatory cells on mutation in rat alveolar epithelial cells. Carcinogenesis 1997; 18: 423-430. European Commission. Cosmetic products – specific topics: nanomaterials. Available online: http://ec.europa.eu/growth/sectors/cosmetics/products/nanomaterials_en (Accessed November, 2016).